Visit Old Forge NY: Adirondack Playground & Snowmobile Capital Of The East! At Old Forge NY, Find Your Choice of Four-Season Adirondack Adventures! Old Forge NY is a bustling Adirondack wilderness community that offers an amazing array of activities and pastimes that lure vacationers back year after year. Spend a day enjoying the rides and attractions at the Enchanted Forest Water Safari. Take a ride on the Adirondack Railroad, or just relax on a sandy beach. 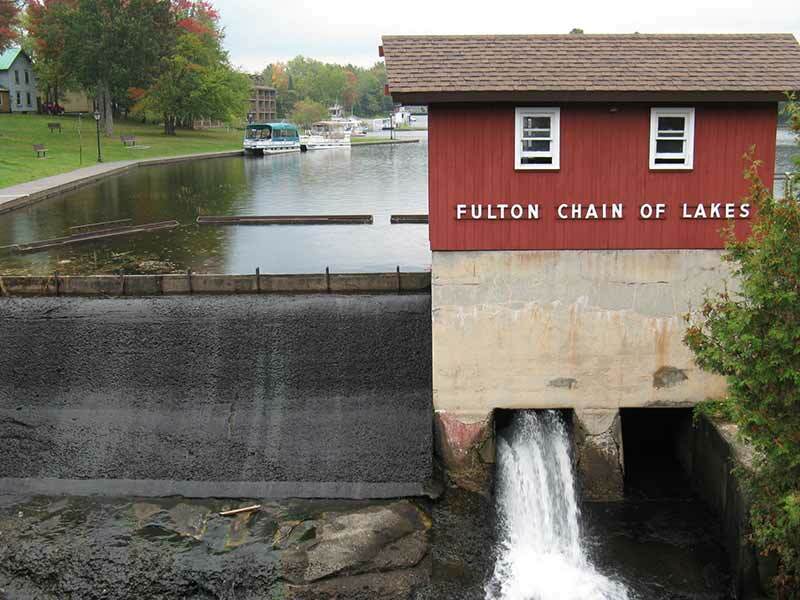 The striking beauty of Old Forge can be appreciated through the extensive biking trails, on horseback, hiking, or paddling on many of the lakes, ponds and streams in the area. Spend the day golfing, sailing, or on a scenic boat cruise. Visitors will find all types of year-round accommodations and lodging in Old Forge. Inns, bed and breakfast, motels, cabins and cottages, and camping are readily available. There are excellent restaurants for fine dining, casual, and kid-friendly eating. Browse the unique shops, markets and clothing stores that offer everything from groceries to exclusive Adirondack artisan wares. Known as the "Snowmobile Capital of the East", Old Forge boasts hundreds of miles of meticulously groomed snowmobile trails that wend their way through the Adirondack wilderness and stretch all the way to the Canadian border. With a typical snowfall of 300", skiing, ice fishing, and snowshoeing are all sports that offer the additional benefit of an incredibly scenic view of the mountains and the wildlife that inhabits the region.